Diamonds, formed by light and dark triangles, inside which are the same diamonds, but smaller. The front side contains a rectangular frame with a geometric pattern, filled with a background in the form of small patterns. 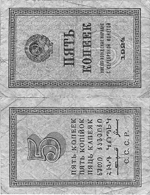 Inside there is a coat of arms of the USSR of the sample of 1923, at the bottom there is a large number "5", above which there are inscriptions: large in two lines - "FIVE KOPECKS", below - "SHOULD BE ACCEPTED ALONG WITH A SILVER COIN", then the year is "1924". 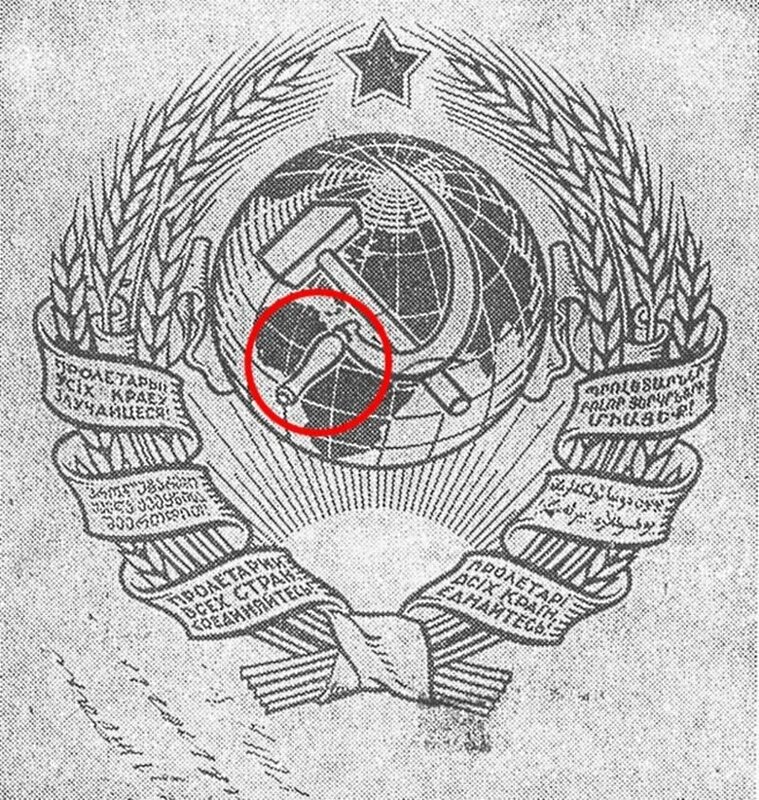 The coat of arms of the USSR sample of 1923. 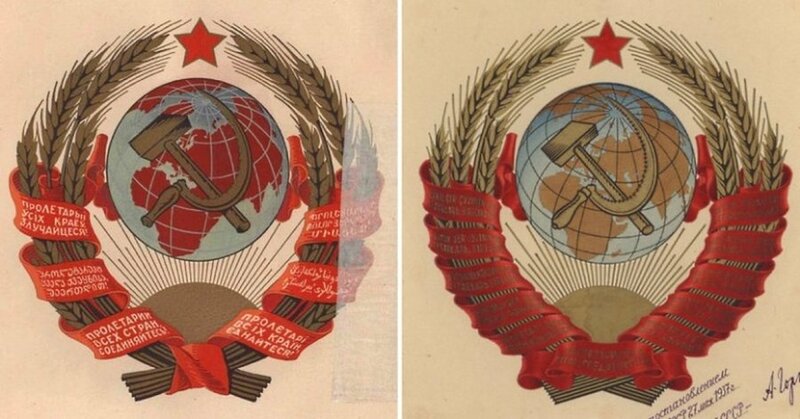 On July 6, 1923, the II session of the USSR CEC adopted a drawing of the coat of arms (simultaneously with the adoption of the draft Constitution). On September 22, 1923, the design of the coat of arms was finally approved by the Chairman of the Presidium of the USSR Central Executive Committee A.S. 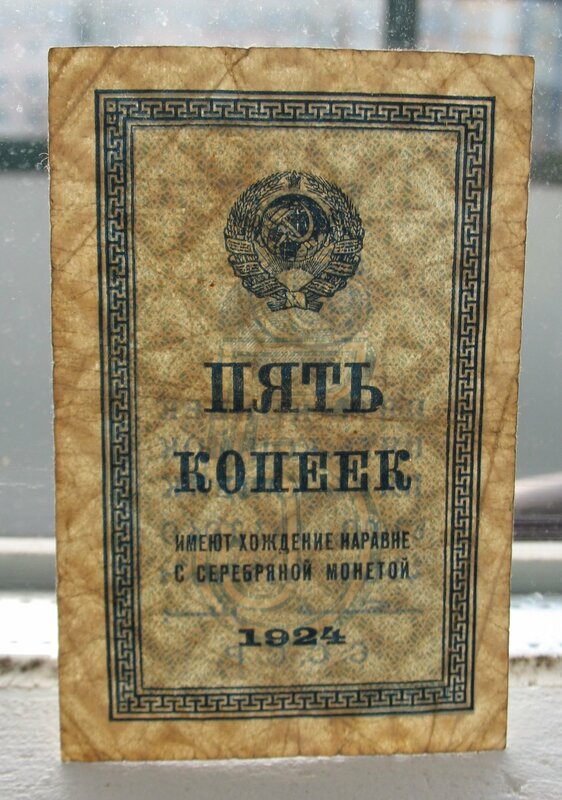 The USSR Constitution, adopted by the II Congress of Soviets on January 31, 1924, officially legalized the new emblem. "70. 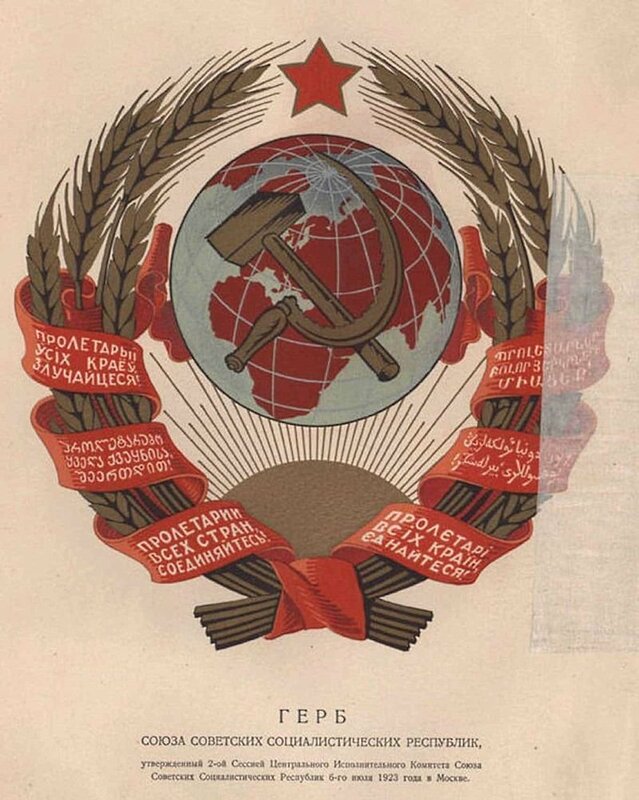 The State Emblem of the Union of Soviet Socialist Republics consists of a sickle and hammer on the globe, depicted in the rays of the sun and framed by ears of corn, with an inscription in six languages ​​[referred to in Article 34]" Proletarians of all countries, unite! " five-pointed star. " Six languages ​​in which the motto was written: Russian, Ukrainian, Belarusian, Georgian, Armenian, Turkic-Tatar (Arabic graphics). In the first version of the coat of arms the sickle was incorrectly depicted. The tool handle was shown upside down! In fact, the thickened part of the handle should be at the bottom, because it creates convenience when working. Most likely, the artist drew a sickle from life, and for this purpose he was provided with the first copy that could not be useful in the household. 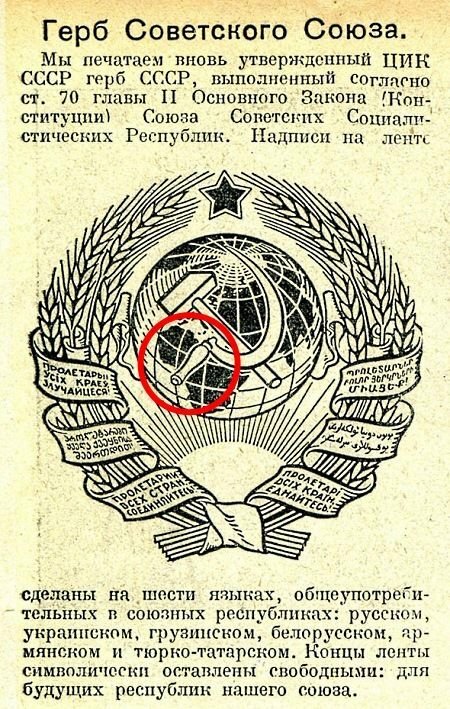 Whatever it was, but the sickle on the first coat of arms of the USSR was painted with an inverted handle. The error was corrected only 14 years later, in 1937, when a new version of the coat of arms was adopted. The back side has the same frame as the front, but its background is slightly different patterns. 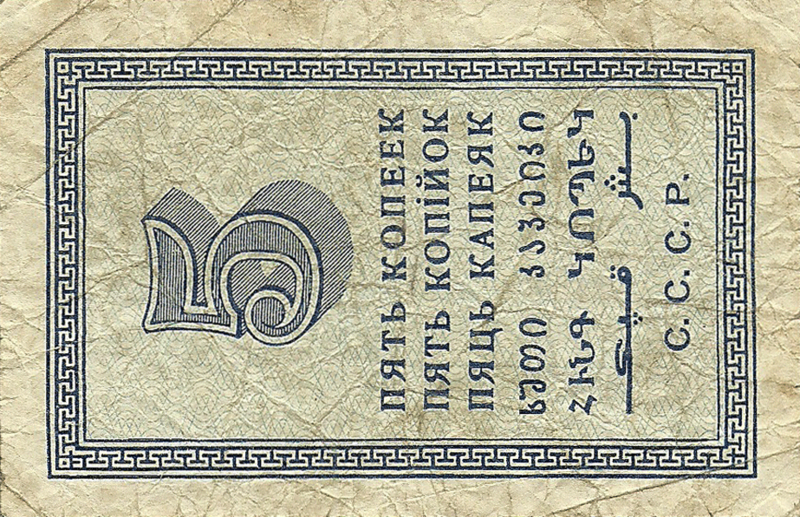 Inside there is a big figure “5”, under it is the nominal in words: “FIVE KOPECKS”, then the nominal is repeated in 6 main languages of republics of the USSR: Russian, Ukrainian, Belarusian, Georgian, Armenian, Turkic-Tatar (Arabic graphics), below the inscription: "C.C.C.P (USSR)". 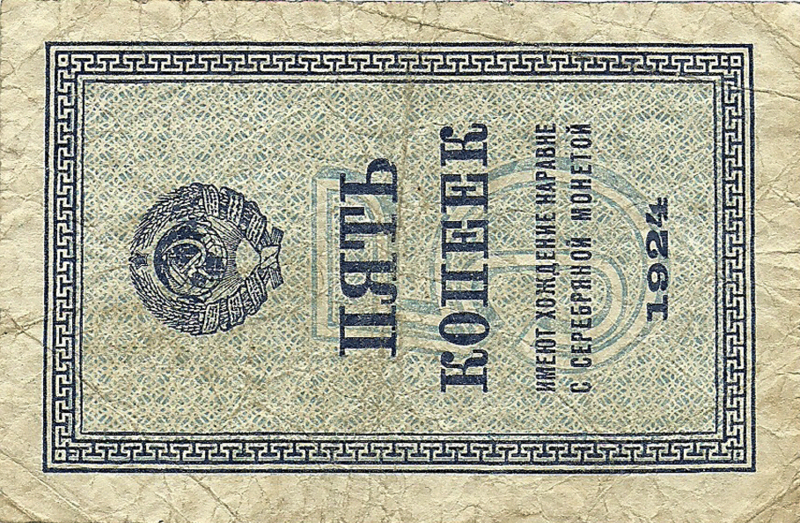 Introduced in February-March 1924 as a supplement to the coins, which were initially issued a limited number. They were accepted until the end of the summer of 1926, but in fact they were almost not used since the beginning of 1925. The drawing is decorated in blue and has a vertical orientation. The design is partially developed by I.I. Dubasov, the author of almost all Soviet bills.